Glass greenhouses have been around for many, many years. They are most frequently seen with an aluminum frame, but there are some that have wood frames as well. They are available in a curved eave, or a straight eave configuration. They come with single glass or double insulated glass. Today all of the glass in greenhouses should be tempered glass. This is a safety glass that will crinkle when it is broken to protect people from getting cut. Please be careful when shopping and make sure that the glass greenhouse you are looking at has tempered glass. Glass greenhouses are beautiful. You can look out your kitchen window during winter and see all of the plants in bloom in the greenhouse. Unfortunately, there are also a couple of disadvantages to all glass greenhouses. They will use more energy to heat or cool, as they do not have the insulation factors that polycarbonate has. I have already mentioned the possibility of the glass breaking and needing to be replaced. There is also the tendency to get hot spots in a glass greenhouse. The best way to overcome this is to put polycarbonate in the roof while retaining the glass sidewalls. Then you get the protection and insulation in the roof, but still maintain your beautiful view with the glass sidewalls. 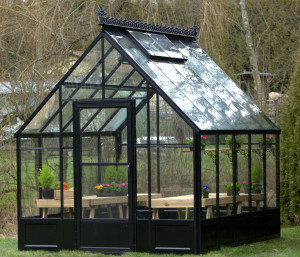 Typically, when you see an Orangerie or a Conservatory they will be larger glass greenhouses. They will also typically have more decorative features on them, although some of the smaller hobby glass greenhouses have a Victorian trim available for the ridge. Some people will build a knee wall for their greenhouse. This is just an elevated foundation and it is done for several reasons. It completely changes the look of your greenhouse and some people will even match the brick in the greenhouse foundation with the brick on their homes. You can also use a stone wall to give the greenhouse a more rustic look. With glass to the ground you may experience water or mud splashing against the glass at the bottom. With the knee wall you will not see “drops” on the glass at the bottom because the water splashes on the wall instead. Also, if you want to store items below your benches, this will give your greenhouse a much cleaner appearance from the outside. 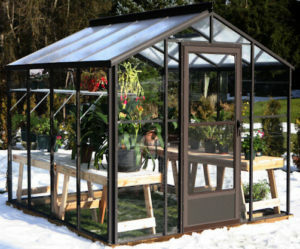 Glass greenhouses are an excellent choice for the backyard hobby grower. They are just like anything else, accessorize them appropriately and they will perform just the way you want them to.